Alexander Dalrymple FRS (24 July 1737 – 19 June 1808) was a Scottish geographer and the first Hydrographer of the British Admiralty. He was the main proponent of the theory that there existed a vast undiscovered continent in the South Pacific, Terra Australis Incognita. He produced thousands of nautical charts, mapping a remarkable number of seas and oceans for the first time, and contributing significantly to the safety of shipping. His theories prompted a number of expeditions in search of this mythical land, until James Cook's second journey (1772–1775) led to the conclusion that, if it did exist, it was further south than the 65° line of latitude South. Dalrymple was born at Newhailes, near Edinburgh, the eleventh of fifteen children of Sir James Dalrymple and his wife, Lady Christian Hamilton, the daughter of the Earl of Haddington. In 1765 he returned to London where was elected a fellow of the Royal Society. There he became acquainted with the civil engineer John Smeaton, who during the course of his studies on windmills had devised a descriptive scale for grading wind speed. This scale was included in the paper for which he was awarded the Copley Medal. In Defining the Wind: The Beaufort Scale and How a 19th-Century Admiral Turned Science into Poetry, author Scott Huler relates that Dalrymple's voyages had convinced him that a standard scale for measuring the speed of wind at sea would be of great value to sailors, and that he had included Smeaton's scale in his work Practical Navigation, which was written around 1790 but never published. It is believed that Dalrymple conveyed this information to Francis Beaufort, who later refined the wind scale that bears his name and that is still in use today. Whilst translating some Spanish documents captured in the Philippines in 1762, Dalrymple had found Luis Váez de Torres' testimony proving a passage south of New Guinea now known as Torres Strait. This discovery led Dalrymple to publish the Historical Collection of the Several Voyages and Discoveries in the South Pacific Ocean in 1770-1771, which aroused widespread interest in his claim of the existence of an unknown continent. 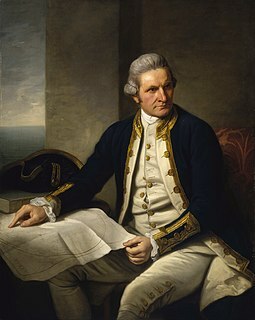 Meanwhile, James Cook had been appointed in his place to lead an expedition to the South Pacific which in 1770 discovered the east coast of Australia. In 1782 he was elected a foreign member of the Royal Swedish Academy of Sciences. Royal Society—Dalrymple was elected to membership in the Society in 1771; and his nomination letter has been posted with other membership records at the Royal Society web site -- here. Those signing that nomination letter were: Benjamin Franklin, Richard Hazard, John Colebrooke, John Pringle, Daniel Wray, Charles Morton, James Burrow, William Hunter, Nevil Maskelyne. ^ Although he gave his year of birth as 1737, Phillimore (1945) noted that his certificates indicated 1736. ^ a b Tracy, Nicholas (1995). Manila Ransomed. University of Exeter Press. ISBN 0859894266. Phillimore, Colonel R.H. (1945). Historical records of the Survey of India. Volume I 18th century. Dehra Dun: Survey of India. pp. 330–331. HMS Dalrymple was a Bay-class anti-aircraft frigate of the British Royal Navy, which served as a survey ship, mostly in the Persian Gulf, from 1948 until 1965. She was completed to deal with the large numbers of uncharted wrecks and mines around the British Isles as a result of World War II. For this purpose she was fitted for minesweeping. She was named for the pioneering Hydrographer of the Admiralty Alexander Dalrymple (1737-1808). Balambangan Island is an island in Kudat Division, Sabah, Malaysia. It is located off the northern tip of Borneo and is situated just about 3 kilometres west of Banggi Island. It is now part of the Tun Mustapha Marine Park. James Horsburgh was a Scottish hydrographer. He worked for the British East India Company, (EIC) and mapped many seaways around Singapore in the late 18th century and early 19th century. 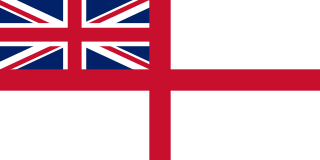 Henry Wilson (1740–1810) was an English naval captain of the British East India Company, from Rotherhithe. He was in command of the British East India Company packet ship Antelope, when it shipwrecked off Ulong Island, near Koror Island in Palau in 1783, and the East Indiaman Warley at the Battle of Pulo Aura.